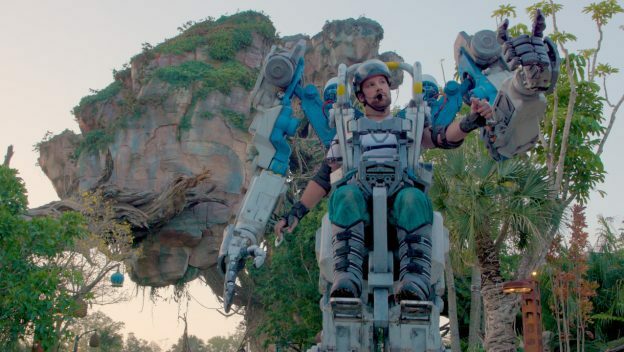 Today Disney Parks announced an upcoming addition to the Pandora area of Disney’s Animal Kingdom – The Pandora Conservation Initiative Utility Suit. Oh goodness. Now, we are RexandtheBeast.com work really hard to not be party poopers. We want to celebrate new happenings at theme parks and, even when it is difficult, acknowledge the need to change and adapt with the times. But sometimes you just have to call things like you see them, and this seems a bit…well…cheap. I’m sure it isn’t, of course. I’m certain the talented folks who spent their time and effort into designing and creating the utility suit are incredibly wonderful artists and engineers. The suit is probably much more advanced and intricate than it appears. But there’s the problem – appearances are everything. And, as some are already saying on Twitter, this appears to be a dumbed down version of the beautifully detailed Transformers over at Universal Studios. Having said all of that, here is the most obvious problem with this approach. The Pandora Conservation Initiative Utility Suits do not exist in the 2009 Avatar film. But something very similar does – Amplified Mobility Platforms. And if you have seen the film, then we all know what the AMPs are most famous for – destruction and death – especially when Quaritch is wreaking all kinds of maniacal havoc toward the end of the film. Yesterday, when a teaser video was released of the new Pandora Utility Suits, we all naturally assumed these were AMPs and we all assumed some nefarious intentions were coming to Pandora, which would not necessarily fit very well with the themeing. But no. Today, the details of the suits have been made known and these are designed for conservation, exploration, and discovery. That, of course, is a theme that fits very nicely for the AK park as a whole. But it is ironic that they are using this approach which, for most fans, elicits ideas of war and pandemonium. I hope it works and, as if often the case, appears much better and more impressive in person than it does on a computer screen. We shall see. RexandtheBeast.com – Join the Journey!